Hi Friends. This cute picture of our daughters really warms my heart. 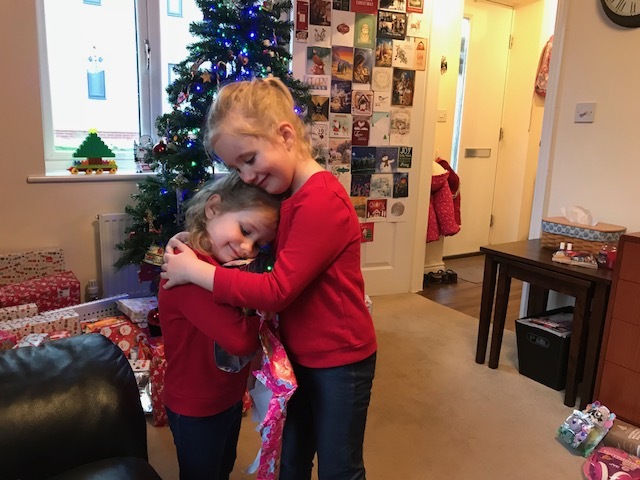 Brenna, the younger one, has just opened her gift from her older sister, Ellen, and is hugging her present. Just thought I'd share it. How are you feeling this Boxing Day? I'm feeling pretty good, thanks, except I keep thinking about how much weight I've put on the past week or so. Not good. I decided that there was no point in waiting until New Years Day to "start" my diet... again. For those of you who don't know me, I have been (struggling to) losing weight pretty much my whole life and have lost a fair amount in the past couple of years, but have been battling the same 10 or so pounds the past year in a half. However, I weigh more this morning than I have in a really long time. I could tell I was putting on weight even without stepping on the scale, because I felt sluggish and my clothes were getting snugger each day. The problem is, food is yummy and I tend to eat too much. I do know, however, when I create a plan and stick to it... day after day... I lose weight. So, this morning, my friend and I went to the gym together. Same time as usual...6am. We did a pretty challenging HIIT workout then 500ft on the Jacob's ladder. Quite tough but I really thrive on challenges, especially when I believe or even know I can do it. 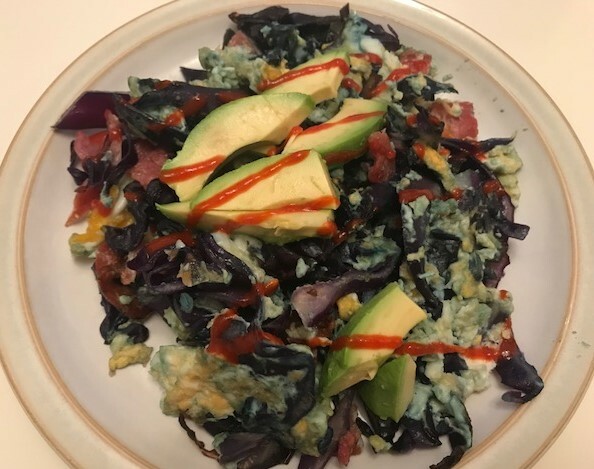 I came home and had one of my favourite breakfasts... a plate of sauteed red cabbage with two scrambled eggs, 1 slice of crumbled bacon, some avocado drizzled with some Sriracha sauce. By the way, if you haven't tried Sriracha sauce, yet and you like to add a bit of kick to your dishes, just go out and buy yourself some Sriracha sauce... it's sooooo goood. So, that was my breakfast this morning and I already feel better for making a couple of healthy steps in the right direction. "Lauren, how exactly does this have anything to do with saving money and finances?" Dieting and exercise have so much in common with finances, and I'd like to share my thoughts on this to inspire you to have a serious think this week, before New Years Day next Monday (when you might be gung ho to start something new), about where you'd like to go this year in terms of your finances. #1: What is your goal? Consider what you'd like to achieve this year. Maybe it's paying cash for your next holiday/ birthday party/ life event, as opposed to putting it on a credit card to pay for after you return from your holiday or have that birthday party or life event. Maybe it's to finally get a written plan in place so you know where every penny you spend is going before you spend a thing. Maybe it's to cut back in little ways so that you can pay off some debt. Maybe it's to start saving for an emergency fund or boost the one you already have, or to contribute more towards retirement, or pay more towards your mortgage. Perhaps you'd like to reach the end of the month or your next paycheck with money still left in your bank account. #2: Does this goal need to be broken down? Perhaps your goal seems too insurmountable, too impossible to achieve. Let me just tell you, that it's likely not impossible - is it possible to break down your goal? For instance, if your goal is to save for your next holiday and pay for it in advance, write down how much you'll need for travel and accommodation. Add to that entertainment, food and other costs. There you go, you have a goal and you've taken the first step of considering the costs. Now, divide that number by the number of paychecks or months until the holiday. That is how much you need to save each paycheck or month prior to the holiday. This seems kind of intuitive, but believe me, the next step may be the hardest. Save that money each month or paycheck for that holiday. This is the application step, the one that you need to work on each and every day to reach your goal. This application part is the part of the diet of remembering to set my alarm the night before, actually getting out of bed at 5:40am the mornings I workout, getting dressed, going to the gym, having a plan in place at the gym, completing the workout, eating meals that are not only nutritious but also delicious, planning meals in advance, telling myself "no, not right now" OFTEN, having a plan for the tough times and identifying the tough times (like 16:00 after the school run when I'm hungry and tired) all while going through your normal, busy day. It's not easy! No one said that taking control of your finances is easy either, but by breaking your goals down into mini goals and steps makes accomplishing these goals completely doable. #3: Stop. Once you have a really good think about what you'd like to accomplish, stop a minute and consider where you are. What are you thinking about and feeling today? Are you really ready to make a change and start working towards your goals? Are there any emotional ties you may have to work through before or while working towards your goals? Maybe there are some challenges you'll have to overcome or work towards. #4: Ask for help. You may be ready to start moving in the direction of your goals but aren't sure you know how or don't want to do it alone. Is there someone you can share your goals with? I am so thankful to be "on the same page" with my husband in regards to our financial goals. Please don't hesitate to share your goals with me. I promise it won't go beyond my ears or eyes. I'd love to walk along with you to help you accomplish your goals. Please feel free to message me on the Finding the Pennies Facebook page. Seriously, I would be absolutely honoured and blessed to help you. #5: Start ASAP. As soon as you're ready, START. You don't even have to know what you're going to do exactly. Just start paying attention to your thoughts and even writing down what you tell yourself about yourself and your goals. But don't wait until a certain time or date. Begin NOW, right now. My goal weight seems elusive, but I know that with every small, "right" decision, I will eventually reach my goal. This is not a sprint, nor something that I will achieve overnight. Every small change, every small achievement all counts! It's all about creating the mindset of working towards my goal every... single... day. That's where I want to walk along side you. I want to help you to create small changes... the pennies... in your life to help you to reach the financial goals you have set out to achieve. I just wanted to share a picture of these cute Santa pancakes that I made for the girls yesterday morning. Simple and cute, right? !